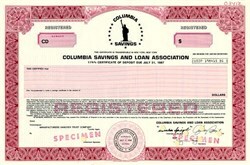 Beautiful engraved specimen certificate from the Columbia Savings and Loan Association printed in 1983. This historic document was printed by Jeffries Banknote Company and has an ornate border around it with a vignette of the Statue of Liberty. This item has the printed signatures of the Company's President and Secretary and is over 24 years old. Feds seek buyer for Columbia S&L assets before the seized thrift deteriorates more. 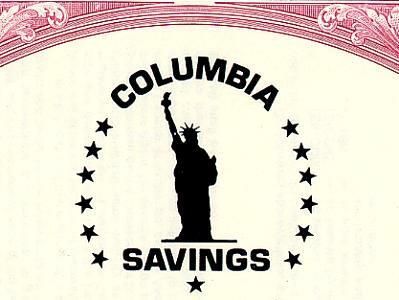 Columbia Savings & Loan Association's recent seizure by federal regulators began a process of finding a buyer for the assets of the junk-bond laden thrift. The seizure, conducted Jan. 25, surprised no one. The Beverly Hills-based thrift faced massive losses in 1989 and 1990 as it was forced to write down its junk bond investments to market and announced in November that it would likely be seized by regulators. As of Sept. 30, 1990, Columbia had assets of $6.6 billion, making it the sixth largest S&L in Los Angeles County. Analysts already estimate the loss to taxpayers of bailing out depositors at $1 billion to $1.5 billion. Federal regulators face the task of managing the thrift and selling it off before it deteriorates further. "It's Regulators said that immediate efforts will be aimed at preparing the institution for sale to investors. "We're going to make it as efficient as possible," said Kevin Shields, a spokesman for the Resolution Trust Corp. "It has a good branch network in California and we should be able to sell it. The question is when." Shields said that large S&Ls like Columbia have taken from 9 to 18 months to sell.